The central figure on this rare carved ivory pendant is distinguished by his placement, his slightly larger size and the large bead at the center of his chest. He is the hereditary king, or oba, of Benin and wears the bead of kingship-an imported red coral, jasper, or agate bead. This bead, a significant emblem of his rank, and the textured bars on the figure's helmet and collar represent the oba's netted red coral and agate garment. Panels on either side of his tunic are shaped like mudfish with filaments hanging from their mouths. Around his waist, three pendants with heads of Portuguese soldiers or officials demonstrate how the pendant was worn. The oba, legs adorned with coral beads, stands on a human head with mudfish issuing from its nostrils. Two high priests, Osa and Osuan, each wearing a waist pendant depicting crocodiles and standing on a frog, flank the oba. These priests, as well as other court officials or sons of the oba, traditionally support the oba during his coronation and ceremonies of importance. This grouping of the triad recalls an eyewitness account of Oba Overami's appearance when he surrendered to the British on August 5, 1897: "He was supported in the usual way by chosen men holding him up by each arm." The pendant's rich and complex iconography can be interpreted from Edo oral tradition, recorded history in European sources, and kingship practice that endures today. 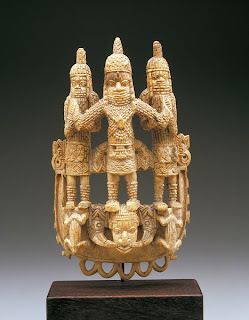 The gesture of support, for example, is not meant to suggest the king is infirm, but symbolizes the delicate balance that must be maintained between the oba's authority and the Edo peoples' willingness to submit to his authority. The mudfish and the frogs are associated with the realm of Olokun, the god of wealth and all waters (streams, rivers, seas, oceans, and the divine) and a source of the oba's supernatural powers. The initial source of Benin's great wealth came from the sea: the first group of Portuguese explorers and traders must have seemed to emerge from Olokun's realm. An ancient belief asserts the oba's legs were so heavily charged that damp soil would lose fertility if touched by his feet. Thus, the oba's power is also manifested in his legs and feet, which are sometimes depicted as mudfish in art. Mudfish are liminal creatures that can survive on land as well as in water. While some varieties are benign and considered a delicacy, and therefore symbolize feasting and prosperity, others are dangerous and can electrocute their adversaries. Benin artists do not differentiate the various types of mudfish in visual art. Frogs are considered mysterious creatures because they seem to change species from tadpole to frog. These creatures present a paradox like the oba, who commands and must keep two worlds, that of the sea and the land, in harmony. The Emobo ceremony, an extant kingship ritual that commemorates the establishment of Benin as the capital of the kingdom, requires an oba to wear waist pendants. According to oral tradition, Esigie, a sixteenth-century prince and founder of the present dynasty, competed with his half-brother Arhuanran, who ruled the province of Udo and was heir apparent to the throne. After the death of their father, Esigie challenged Arhuanran's ascent. He succeeded with the help of Edo chiefs, Portuguese allies, and most importantly, his mother Idia. Defeated, Arhuanran cursed the bead of kingship. Oba Esigie subsequently went insane when he wore the bead. The story, however, has a happy ending: Idia used her incredible spiritual powers to break the curse and thereby restore her son's sanity. Today he is considered one of Benin's most successful rulers. The Emobo ceremony also expels negative spirits from the capital city. According to some accounts, those negative spirits have been sent to Udo. This rare ivory pendant is one of five that were taken by Private William Kelland of the British Royal Marines as souvenirs of the British Punitive Expedition in 1897. The other pendant plaques are in the collections of the Buffalo Museum of Science, the Nigerian National Museum, Lagos, and the National Museum of Scotland, Edinburgh.